(CNN) - Popes John XXIII and John Paul II will be declared saints in April, the Vatican said Monday. The announcement came after Pope Francis met with cardinals to discuss the planned canonizations of two of his predecessors. The ceremony will take place on April 27. It will be the first time two popes will be canonized at the same time. To be named a saint involves a series of steps, but the qualifications are straightforward, according to the veteran Vatican analyst John Allen. "You put a holy life and two miracles together, according to the Catholic system, you've got a saint," he said. Lancaster County, Pennsylvania (CNN) - Among the flowers and plants in Marie Monville’s sunny yard sits a rosebush, a gift from her first husband, Charlie. A few years ago, Monville painstakingly unearthed the roots and transplanted the bush from her old house 10 miles away - a house that Charlie had thrown into tumult and grief. The bush’s prickles recall the pain she and her family have endured, Monville said, and its peach-colored blossoms offer a yearly reminder that God creates new life from old. After years of silence, Monville is now telling a story of her own. It’s the story of how a milkman’s daughter became a murderer’s wife, and how she found a divine calling after a devastating tragedy. Pope Emeritus Benedict XVI, left, greets Pope Francis during a March meeting at the Vatican gardens. 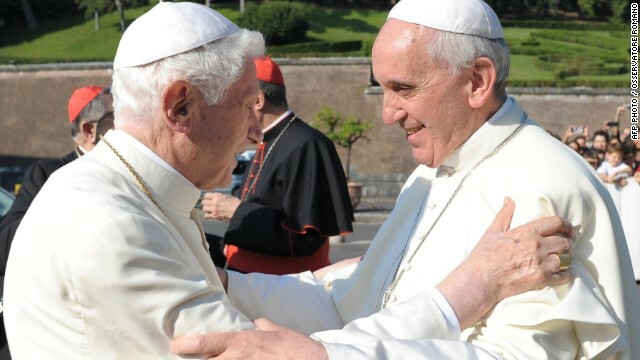 (CNN) - Retired Pope Benedict XVI says he never tried to cover up the sexual abuse of minors by Catholic priests, breaking his post-retirement silence to address one of the greatest threats to his legacy as a church leader. Earlier this month, La Repubblica also published a letter to its atheist editor from Pope Francis, Benedict's successor. That’s how liberal Catholics responded to the stunning interview published Thursday in which Pope Francis bluntly said the church shouldn’t be “obsessed” with culture war issues like abortion and gay marriage. “It is not necessary to talk about these issues all the time,” the pope said, warning that the church's moral foundations will fall "like a house of cards" unless it strikes a "new balance" between preaching the gospel and taking stands on divisive issues. How did conservative Catholics, the church’s most ardent culture warriors, react? “I’ll be honest; I was disturbed,” writes Matthew Archbold in the conservative National Catholic Register. 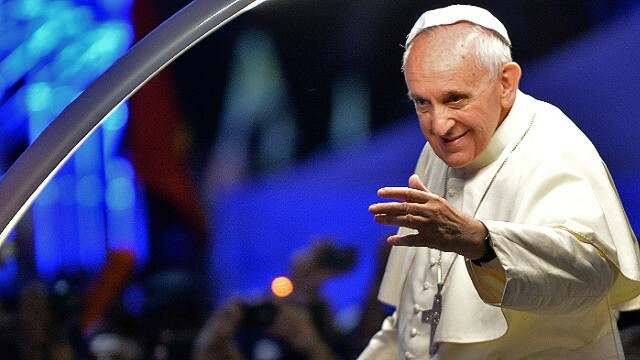 (CNN) - Pope Francis said the church has the right to express its opinions but not to "interfere spiritually" in the lives of gays and lesbians, expanding on explosive comments he made in July about not judging homosexuals. In a wide-ranging interview published Thursday, the pope also said that women must play a key role in church decisions and brushed off critics who say he should be more vocal about fighting abortion and gay marriage. Moreover, if the church fails to find a "new balance" between its spiritual and political missions, the pope warned, its moral foundation will "fall like a house of cards." The interview, released by Jesuit magazines in several different languages and 16 countries on Thursday, offers perhaps the most expansive and in-depth view of Francis' vision for the Roman Catholic Church. The pope's comments don't break with Catholic doctrine or policy, but instead show a shift in approach, moving from censure to engagement. When asked “Who is Jorge Mario Bergoglio?” the pope replied, “I am a sinner. This is the most accurate definition." (CNN) - Here at America magazine, we’ve been anticipating the exclusive interview with Pope Francis for Jesuit journals worldwide for weeks. We’ve lived with the 12,000-word article we’ve titled “A Big Heart Open to God,” and, in a sense, with the pope over these last several days. So let me suggest what I feel to be the most important parts of this remarkable interview. To focus, I’ll highlight a few quotes and unpack them. Lake Forest, California (CNN) — In his first interview since his son's suicide in April, famed pastor Rick Warren told CNN that he knew his son, Matthew, had bought a gun, dismissed rumors that Matthew was gay and said he doesn't blame God for the tragedy. "I have cried every single day since Matthew died," Warren said Tuesday in an exclusive interview with CNN. "But that - that's actually a good thing. Grief is a good thing. It's the way we get through the transitions of life." Rick Warren and his wife, Kay, founded Saddleback Church in Southern California in 1980, growing it from a small congregation to a multisite megachurch with some 20,000 weekly worshippers. Warren is also author of the spiritual self-help guide “The Purpose Driven Life,” one of the best-selling books of all time, with more 36 million copies sold. But even as the Warrens grew in prominence - attending conferences with presidents and prime ministers - their son Matthew struggled with borderline personality disorder and deep depression, they said during an interview with CNN’s Piers Morgan. (CNN) - Best-selling author and megachurch pastor Rick Warren is one of the country's most influential Christian leaders. But Warren and his wife, Kay, have nearly disappeared from public view since their son's suicide in April. That changed Tuesday night, when Rick and Kay Warren spoke with CNN's Piers Morgan about the death of their son, how their faith has changed and their new mission in life. Here are five things to know about the Warrens. Lake Forest, California (CNN) - Rick and Kay Warren stood outside their son's home, sobbing in each other's arms. They had talked Matthew, 27, off the ledge many times. But not this time. A nod from a police officer who inspected Matthew's house confirmed their worst fears. “I just hit the ground,” Kay Warren said.